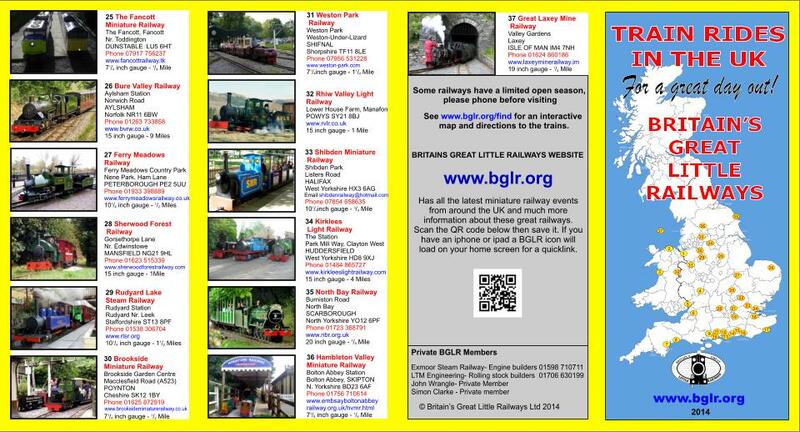 Britain’s Great Little Railways Ltd was formed in 1994 in order to create a forum for miniature and narrow gauge railway operators, owners along with associated traders. It’s a company limited by guarantee. The organisation provides opportunities to exchange information views/ideas on many matters. 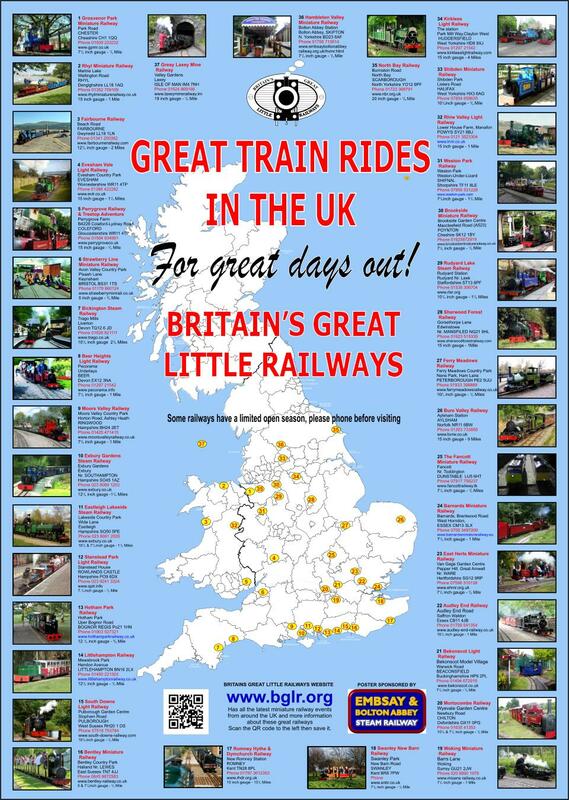 We are active in promoting our members’ interests by publishing 50,000 annual leaflets, posters and this website which all list our 40+ member railways. We are a group member of the Heritage Railway Association (HRA) which enables our members, some of whom might not meet the criteria or afford to join individually, to enjoy the benefits of the organisation at a far lower cost. The company has links with HSE/HMRI and is involved in matters of legislation at the formation stage. The HRA take the leading role for all railways which come within the scope of the Railway Inspectorate but for those with gauges below 350mm we take the lead in advising the HRA/HSE/HMRI. A quarterly e-Newsletter is published so that all members are kept in contact with each other and developments. Any items of interest which are passed on by the HRA are also circulated to members. The company is managed by 5 Directors appointed by the members at the Annual General Meeting which is held in March each year. During the year there are two meetings arranged which are hosted by one of our members and are always in different locations. The dates are arranged to be outside the main operating season. The company dedicates all its available funds to promoting its work. No person receives any payment for work done. Membership is open to Owners/Operators of Miniature Railways at £65 p.a. if featured on the poster and brochure and £35 p.a. if not. Prospective owners can also join for £35 p.a. Interchange of ideas, knowledge, successes and failures. Annual Production of publicity posters and leaflets to advertise our members’ railways. Web links from this web site and other members web sites. HRA Membership including participation in their Interail scheme. National level representation to HSE/HMRI on safety issues. Creation of guidelines for railway construction & operation in different gauges to allow exchanges between members. 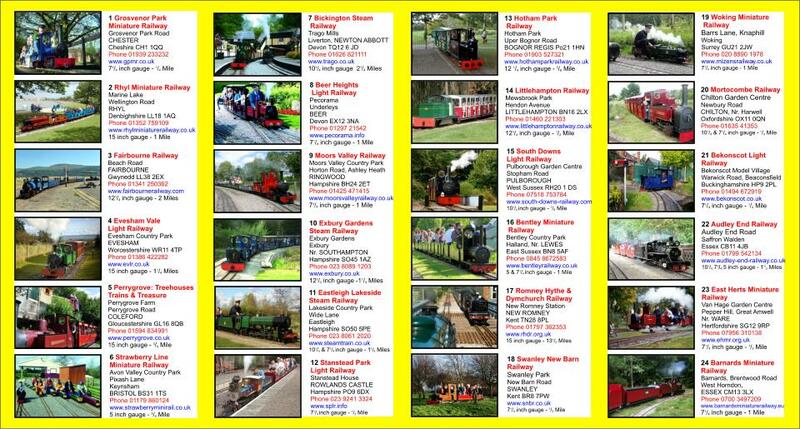 Index of policies, records and procedures for safe miniature railway operation. Advice on many issues (i.e. V.A.T., Insurance, web sites. advertising etc). Finally friendship and support from like minded people.